Shared Inspiration by Jill Jacobsen: Fall is on it's Way! Getting ready to head to Jacksonville for the weekend to share at the Creating Keepsakes Convention...if you are in the area come see me:) Here is a card that I started last year! Yes, I said last year....the main panel was done last year and for some reason it did do anything for me and ended up in the stash...then the other day I found it again and the inspiration hit me! 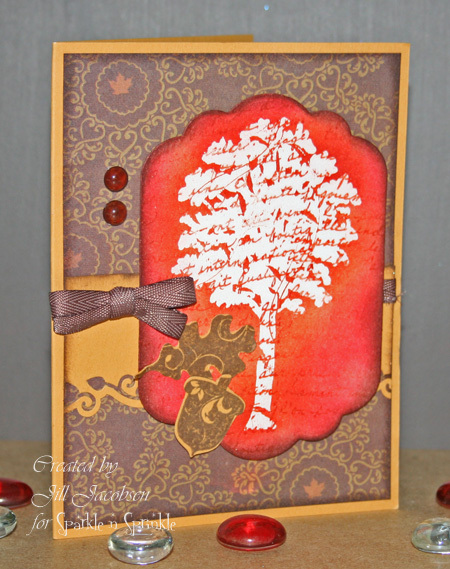 The main panel has the Script stamp in the background, then I embossed the Maple Tree from Autumn Swirl in Clear embossing powder then sponged on some inks. I was creating the Cutting Edge files for my Autumn Swirl set last week and thought that they would go nicely with it. 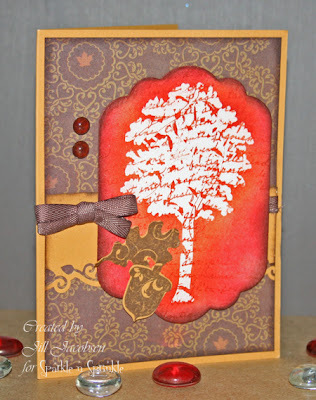 I have been having so much fun playing with the Pazzles Inspiration....check back later and I will share with you a sneak peek at a new fall stamp set I have created and the fun Cutting Edge files to match!! pretty, Jill! Glad I'm not the only one with partial cards made!